Ramirez has been farming this plot of 25 acres (10 hectares) in Pescadero, California, for 11 years. He’s called a “tenant farmer,” an arrangement typical in this rural, coastal area of San Mateo County. The land he works is owned by the Peninsula Open Space Trust. Thanks to winter rains this year, he has enough water, which he pumps from Pescadero Creek, to allow him to plant flowers, fava beans, sage and thyme, in addition to his berries, which will become the filling in the local tavern’s signature olallieberry pie. This year’s lack of water stress is a sharp contrast to the last several years when the region was slammed by drought and Ramirez fallowed nearly half his acreage. And it’s not just farmers like Ramirez who were impacted. Up the creek is Memorial Park, one of several forested county parks that are flush in the summer with campers and hikers. But the parks, too, have felt the effects of drought. 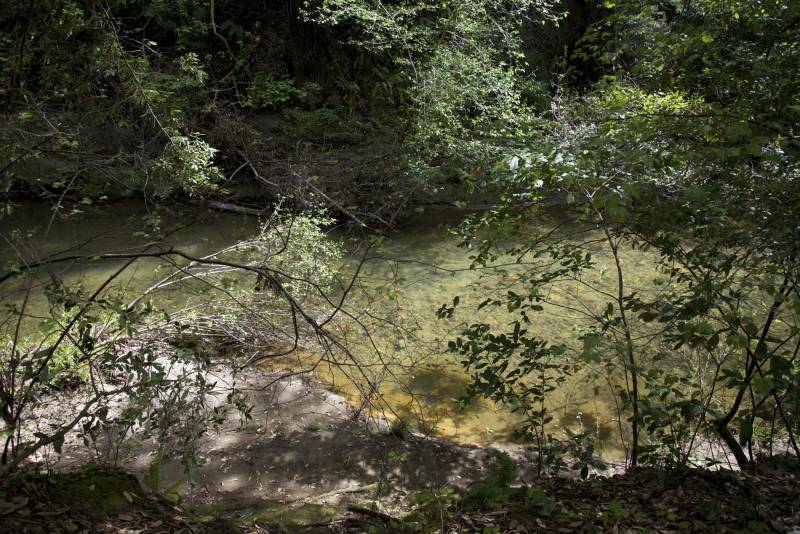 In 2014 the San Mateo County Parks Department had to close the campground and cancel 2,500 reservations because of low water and an algae bloom in the creek – a considerable ding to revenue, said Marlene Finley, the director of San Mateo County Parks. Last year they only booked the campground at half capacity, closed the showers and brought in portable toilets to save water. “The drought has affected us all severely,” said park ranger Vern Selvy. This south coast area has no large water utilities or big reservoirs and is not connected to any of the state or federal water projects that funnel snow melt from the Sierra Nevada. 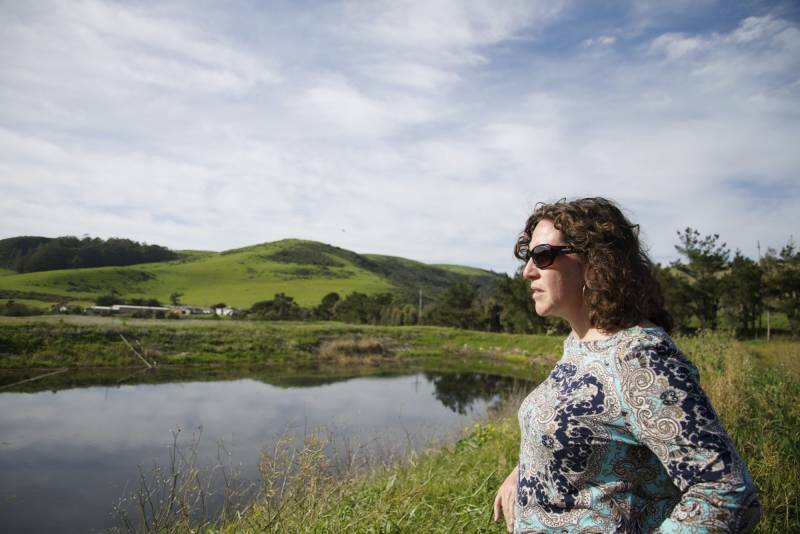 “Fish, farms and people here depend on the same limited water resources,” said Kellyx Nelson, executive director of San Mateo County Resource Conservation District, which works as an independent liaison between public agencies, landowners, land managers and special interest groups to protect, conserve and restore natural resources. This resource sharing has led to innovative partnerships and projects, but big concerns still remain that have been made more obvious in times of water shortage. In many ways the area is self-reliant and fairly isolated. Most people who visit here snake along the curves of beautiful Highway 1 and stop to enjoy the beaches, wildlife and picture-perfect Pacific sunsets. It’s easy to miss the small roads penciled into the hillsides and the houses hidden in the thick tanoak and redwood forests just miles inland from the ocean. People who live here like the isolation, said Don Horsley, the San Mateo County supervisor whose district covers the area. But it comes with its own set of challenges. Sparsely populated areas here depend on water drawn from creeks, wells and springs. The county has eight water providers classified by the state as small water systems. Some of these have only a single connection or at most 14. Other public water systems in the coast area south of Half Moon Bay serve less than 100 connections and some just a few. “Many of these residences were originally built as vacation homes, but now have people living in them year round,” said Horsley. This can put a strain on water resources in lean years. Those who rely on water pumped from Pescadero Creek and other streams or springs found they didn’t have enough water during some of the summer months of the last few drought years. Many were forced to pay companies that hauled water into the area by truck. “We don’t want more people to live in these areas but we do want to support the people and businesses which do,” said Horsley. He said his office helped by waiving fees and fast-tracking drilling permits for new wells for many of the local water providers, most of which are owned by the collection of landowners they serve. Upgraded water systems and septic systems are needed throughout the area and they are currently exploring other water sources to take the pressure off creeks. Municipal water providers are required to take stock of water resources and plan decades out for projected water demand. But many areas of coastal San Mateo County don’t have municipal water providers large enough to be tasked with this state mandate. “We don’t know how much water is consumed now and we don’t know how much will be needed in the future,” said Nelson. As self-reliant as many people and communities are here, there are also many interconnections. Part of this comes from the simple laws of nature. When something changes in the environment, like the meander of a creek or the amount of rain, it has a ripple effect on everyone from fish to farmers. Take Ramirez, for example. He pumps water from Pescadero Creek, a resource he shares with steelhead trout and coho salmon. And the drought has been especially hard on the fish, with populations in critical shape as local creeks have gone dry. Last fall the last dam on the creek, which was in Memorial Park, was removed, opening up 62 miles (100km) of needed habitat that was previously out of reach for most young fish, or smolts. The fish need not just enough water, but the right kind of habitat, like pools, varying water depths and shaded, cool water. Removing dams and creating habitat complexity is also an important strategy for surviving drought. Both fish and farmers are trying to adapt to the same conditions. In order to maintain the watersheds for healthy fish and other wildlife, farmers like Ramirez are trying to use less creek water and use what they have more efficiently. The Pacific Open Space Trust, which owns his land, has drilled a well that will help Ramirez cut down on the amount of water he draws from Pescadero Creek and he has changed to more efficient sprinkler heads on his irrigation. Another strategy is developing water storage by building retention ponds to capture rain and runoff during the winter months that can be used as a water supply in the summer when creek flows are especially low and especially critical for fish. Ramirez is hoping to have a pond built on the property he farms. And nearby flower grower Dave Repetto wants to upgrade an existing pond on his land. It sounds like an easy solution, but its implementation is caught in a thicket of regulations. “Projects here are critically needed, they are dire,” said Nelson. “And they are also extraordinarily complex.” To get anything done, a potential project to improve water systems or the watershed, may involve seven or eight local, state and federal agencies. And this is where interdependence becomes a potential detriment. Repetto has land just north of Pescadero in the San Gregorio watershed. There is an existing retention pond on his property, but he’s hoping to line this pond so that water is not lost. But ponds like his have become a refuge for protected species such as the San Francisco garter snake and the California red-legged frog. In order to maintain the pond and upgrade it, vegetation will need to be removed and that can negatively impact the species. “We’re being told that in order to do this project that is being identified in the federal recovery plan for endangered salmon, that we have to do mitigation for the frog, which makes the price tag and the complexity and the timeline on these things go through the roof,” said Nelson. “Farmers created habitat for a species that was pushed out of places that were developed and now it is difficult to maintain these features on the landscape because of the presence of the very thing they helped to save – that’s a catch 22,” she said. It is costing about a half a million dollars for each pond, said Nelson, and a huge amount of that is permitting expenses, biological surveys and biological monitors. Doniga Markegard, of Markegard Family Grass-Fed which raises grass-fed beef and lamb, chicken and pasture-raised pork, has experienced this same problem. In trying to find ways to store water to adapt quickly to drought emergencies, they’ve been slowed by an expensive bureaucratic process, she said. They are tenant farmers on ranchland her husband has managed since 1987 and 2014 was the first time their water sources ran dry – both the springs and stock ponds for their animals and the spring water that supplies their home and family of six. Despite these difficulties, Nelson said, farmers and ranchers in the area continue to innovate and try new ways to manage their land with the least impact on resources like water, because drought here hits close to home.